The National Early Childhood Program Administration Accreditation was established in 1991 to encourage quality and recognize excellence in early childhood programs throughout the United States and other countries. We pledge to remain focused on the interests of children by promoting benchmarks for high quality standards throughout the early care and education profession. We are “The Next Generation in Accreditation”. If you are unhappy with the decision following your verification visit, follow this link to the Appealing Accreditation Decision Procedures document. NECPA Annual Renewal Reports – https://inaeyc.org/wp-content/uploads/2017/07/Annual_Renewal_Report_2017.pdf . If you need more information regarding the submission of the NECPA Annual Renewal Reports, follow this link to the Procedure for the Submission of Annual Renewal Reports. NECPA Accreditation Extension Request – Miss a deadline and you need an extension? 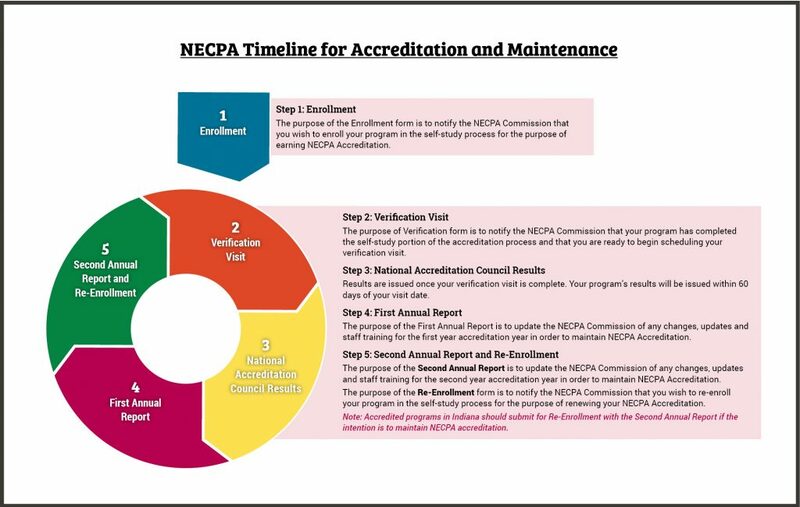 Follow this link to the NECPA Accreditation Extension procedures. Change of Location – NECPA Accredited programs that undergo a change of location must alert the NECPA office to receive a 6 month change of location extension. The 6 month extension begins on the date of program change in location. Follow this link to the Change in Location form that you MUST submit to NECPA. There are fees associated with maintaining accreditation after a location change for which the Indiana Accreditation project will not assume responsibility. Click here to review Change of Program Location Fees. Change in Ownership – NECPA Accredited programs that undergo a change of ownership must alert the NECPA office to receive a 6 month change of ownership extension. The 6 month extension begins on the date of program ownership change. Please complete the Change in Ownership form and send to NECPA. Programs shall report any notice of suspension, probation, provisional, or revocation in licensing status, or a change in license number within 72 hours of its occurrence. Programs shall report any of the following within 30 days of occurrence: Change in Program Contact Information; Change in Director and/or Administrator; Change in Program Name; Modification and/or Expansion of Current Building(s) or Grounds; Significant Damage to the Building or Outdoor Areas; Addition or Reduction of an Age Group; Change in Hours of Operation; Legal Action and/or Criminal Activity; or Non-Compliance with NECPA Standard(s). Health Protection and Promotion – includes handwashing, medications, illness and injury management, etc. Building, supplies, Equipment, and Transportation (if provided) – includes toxic substances policies, diaper changing areas, etc. 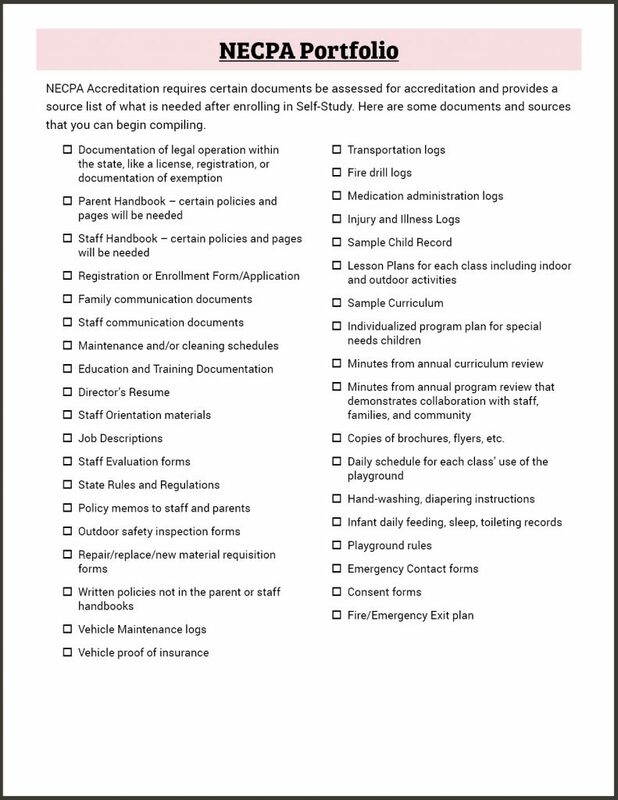 Health and Safety – includes evacuation drills, emergency plans, etc. Need more help or have more questions? Contact NECPA!